Ugo Foscolo (Italian: ; 6 February 1778 in Zakynthos – 10 September 1827 in Turnham Green), born Niccolò Foscolo, was an Italian writer, revolutionary and poet. He is remembered especially for his 1807 poetry book Dei sepolcri. Foscolo was born on the Ionian island of Zakynthos (Zante). His father was Andrea Foscolo, an impoverished Venetian nobleman, and his mother Diamantina Spathis was Greek. Amongst his Paduan teachers was the abbé Cesarotti, whose version of Ossian had made that work highly popular in Italy, and who influenced Foscolo's literary tastes; he knew both modern and Ancient Greek. His literary ambition revealed itself by the appearance in 1797 of his tragedy Tieste—a production which obtained a certain degree of success. Foscolo, who, for causes not clearly explained, had changed his Christian name Niccolò to that of Ugo, now began to take an active part in the stormy political discussions which the fall of the republic of Venice had provoked. He was a prominent member of the national committees, and addressed an ode to Napoleon Bonaparte, expecting Napoleon to overthrow the Venetian oligarchy and create a free republic. The Treaty of Campoformio (17 October 1797), by which Napoleon handed Venice over to the Austrians, gave a rude shock to Foscolo, but did not quite destroy his hopes. The state of mind produced by that shock is reflected in his novel Ultime lettere di Jacopo Ortis (The Last Letters of Jacopo Ortis) (1798), which was described by the 1911 Encyclopædia Britannica as a more politicized version of Goethe's The Sorrows of Young Werther, "for the hero of Foscolo embodies the mental sufferings and suicide of an undeceived Italian patriot just as the hero of Goethe places before us the too delicate sensitiveness embittering and at last cutting short the life of a private German scholar." Still hoping that his country would be freed by Napoleon, he served as a volunteer in the French army, took part in the battle of the Trebbia and the siege of Genoa, was wounded and made prisoner. When released he returned to Milan, and there gave the last touches to his Ortis, published a translation of and commentary upon Callimachus, commenced a version of the Iliad and began his translation of Lawrence Sterne's Sentimental Journey. He also took part in a failed memorandum intended to present a new model of unified Italian government to Napoleon. In 1807, Foscolo wrote his Carme Dei sepolcri, which may be described as a sublime effort to seek refuge in the past from the misery of the present and the darkness of the future. The mighty dead are summoned from their tombs, as ages before they had been in the masterpieces of Greek oratory, to fight again the battles of their country. 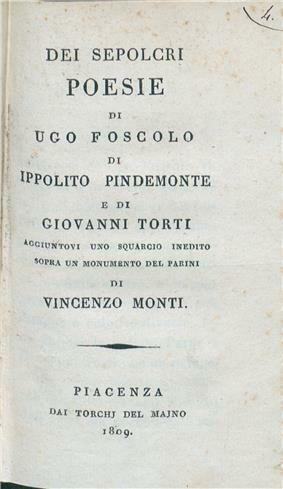 The inaugural lecture On the origin and duty of literature, delivered by Foscolo in January 1809 when appointed to the chair of Italian eloquence at Pavia, was conceived in the same spirit. In this lecture Foscolo urged his young countrymen to study literature, not in obedience to academic traditions, but in their relation to individual and national life and growth. When serving with the French he had been at the Boulogne camp, and had traversed much of the ground gone over by Yorick in Laurence Sterne's novel of the same name; and in his memoir of Didimo Cherico, to whom the version is ascribed, he throws much light on his own character. 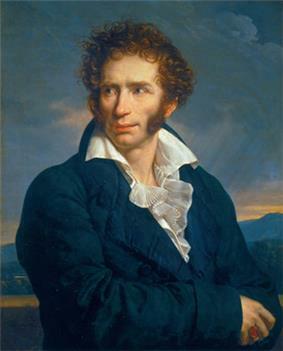 He returned to Milan in 1813, until the entry of the Austrians; from there he passed into Switzerland, where he wrote a fierce satire in Latin on his political and literary opponents; and finally he sought the shores of England at the close of 1816. 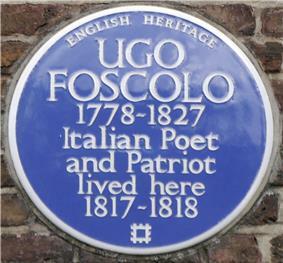 During the eleven years spent by Foscolo in London, until his death there, he enjoyed all the social distinction which the most brilliant circles of the English capital confer on foreigners of political and literary renown, and experienced all the misery which follows on a disregard of the first conditions of domestic economy. His contributions to the Edinburgh Review and Quarterly Review, his dissertations in Italian on the text of Dante and Boccaccio, and still more his English essays on Petrarch, of which the value was enhanced by Lady Dacre's admirable translations of some of Petrarch’s finest sonnets, heightened his previous fame as a man of letters. However, he was frequently accused of financial sloppiness, and ended up spending time in debtor's prison, which affected his social standing after his release. His general bearing in society — as reported by Sir Walter Scott — had not been such as to gain and retain lasting friendships. He died at Turnham Green on 10 September 1827 and was buried at St Nicholas Churchyard, Chiswick, where his restored tomb remains to this day; it refers to him as the "wearied citizen poet", and incorrectly states his age as 50. Forty-four years after his death, on 7 June 1871, his remains were brought to Florence, at the request of the King of Italy, and with all the pride, pomp and circumstance of a great national mourning, found their final resting-place beside the monuments of Machiavelli and Alfieri, of Michelangelo and Galileo, in the church of Santa Croce, the pantheon of Italian glory he had celebrated in Dei sepolcri. As noted by historian Lucy Riall, the glorification of Ugo Foscolo in the 1870s was part of the effort of the Italian government of this time—successful in completing the Unification of Italy but at the cost of a head-on confrontation with the Catholic Church—to create a gallery of "secular saints" to compete with those of the Church and sway popular feeling in favor of the newly created Italian state. However, the quality of Foscolo's work is undisputed. ^ First edition by Vincenzo Di Benedetto, Turin 1991.